Alex McKeel poses in his Kylo Ren costume, a villain from the newly released Star Wars: Episode VII - The Force Awakens film, at his home Tuesday, Dec. 15, 2015, in Chattanooga, Tenn. POLL: Will you see "Star Wars: The Force Awakens" in a theater? Want to see local Star Wars fans strut their finest galactic duds at a local showing of “The Force Awakens?” Members of costuming collective Chattooine will be at Carmike East Ridge (5080 South Terrace) tonight and Saturday night, Dec. 18-19, from 6 p.m. until “late into the night.” In addition to posing for photos in their costumes, they’ll also be posing Star Wars trivia questions to guests while they wait. The first sneak peek of "Star Wars: Episode VII — The Force Awakens" arrived more than a year ago, but local fans say their excitement for the long-awaited continuation of the series hit fever pitch in the days leading up to tonight's premiere. "I am very excited to see this movie," said Shellina Blevins, a Star Wars fan and member of local fandom and costuming collective Chattooine (a play on words for Tatooine, the home planet of hero Luke Skywalker and his father, villain Darth Vader). "It feels nostalgic and fresh at the same time. The trailers made me tear up, and I don't get emotional much, so that is a high compliment." Ticket presales for "The Force Awakens" became available on Oct. 19, and the resulting influx of orders crashed ticketing platforms such as Fandango.com. The Hollywood Reporter on Tuesday reported that early purchases have surpassed a record $100 million — four times more than previous record holder "The Dark Knight Rises" — and ultimately could be as high as $120 million. Locally, many showings for tonight's premiere, which begin at 7 p.m., began selling out days in advance. Blevins said she plans to attend screenings dressed as Princess Leia from the 1977 original, "Star Wars: Episode IV — A New Hope." She was "raised on" the Star Wars movies, which her father also loved, and the films' cross-generational appeal makes the series' return to the big screen all the more exciting, she said. "Star Wars is a space opera that brings so many people together that have nothing in common because it pulls at your inner child and makes you smile and cry," she said. "You can't tell me that with all that is going on in the news these days that we all don't need something as simple as a Star Wars movie in our lives right now." 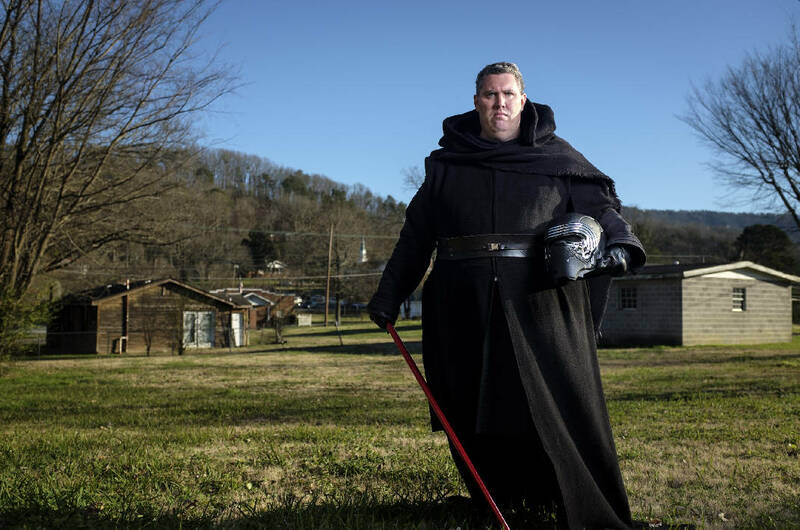 About 60 members of Chattooine plan to dress up for screenings of "The Force Awakens" throughout the weekend. Although the collective routinely makes in-costume appearances for the debut of sci-fi, fantasy and superhero blockbuster films, "The Force Awakens" seems to have touched a nerve among its members, said Chattooine event coordinator Rickie Blevins. "We'll have a huge, huge, huge crowd there," he said, laughing. "It's going to be insane." The steady build of anticipation for "The Force Awakens" — the first new entry in the saga since 2005's "Star Wars: Episode III — Revenge of the Sith" — began in November 2014 with an 88-second teaser trailer that racked up a record-setting 58 million views in its first week on YouTube. A longer trailer, released on Oct. 19, 2015, during "Monday Night Football" and later online, shattered that record — garnering more than 112 million views and earning the No. 4 spot on Wall Street Journal's list of 2015's Best Pop Culture Moments. "Impressive, as Darth Vader would say. Most impressive," joked Journal bloggers Mike Ayers and Michael Calia of the trailer's entry on their list. The J.J. Abrams-directed epic first was announced in 2012, soon after the $4 billion acquisition of Star Wars rights holder Lucasfilm by the Walt Disney Co. Ever since, the film has been one of the most anticipated in years and is projected to smash box-office records with an estimated opening weekend of $200 million to $220 million, according to analysts. If achieved, that would surpass yet another cinematic record set earlier this year by "Jurassic World," which earned $209 million. Plot details of "The Force Awakens" have been kept under tight wraps, but a flood of trailers and pre-release content has tantalized fans with hints of the narrative. The film is set about three decades after the events of 1983's "Star Wars: Episode VI — Return of the Jedi" and features the return of beloved characters such as Luke Skywalker (Mark Hamill), Han Solo (Harrison Ford), Leia (Carrie Fisher) and Chewbacca (Peter Mayhew). Although they are excited to see the parade of familiar faces, local fans say they are just as interested to discover the role played by newcomers such as Finn (John Boyega), Rey (Daisy Ridley) and masked antagonist Kylo Ren (Adam Driver), whose crackling tri-bladed lightsaber has been featured prominently in the pre-release materials. "I plan to dress up as Kylo Ren for the premiere," said Alex McKeel, an education major at Chattanooga State Community College and member of several Star Wars costuming groups, including Chattooine. McKeel has been working for months on his outfit for the debut. Seeing Star Wars' return to theaters has a cyclical significance to him, he said, because the first movie he remembers watching on the big screen was "Star Wars: Episode V — The Empire Strikes Back" in 1980. "This is a continuation of the stories I grew up with," he said. "Lucas promised us many years ago we would eventually see [Episodes] VII through IX. I am also looking forward to seeing Disney's take of a galaxy far, far away." Like many Star Wars fans, Chattooine member Jeff Hickey said he was disappointed by the prequel trilogy of Star Wars films: "The Phantom Menace," "Attack of the Clones" and "Revenge of the Sith." Those films, however, were all directed by series' creator George Lucas, whose role on "The Force Awakens" is listed as "creative consultant," according to the Internet Movie Database. Based on what he's seen in the trailers, Hickey said he appreciates the approach Abrams has taken with the new film's look, which eschews the computer-generated visuals of the prequels in favor of the physical models and puppetry used in the first three films. He's hopeful "The Force Awakens" will be the Star Wars film he and so many other fans have been craving. "Although [Disney] gave J.J. Abrams a lot of support, I'm sure they've been involved from the start and wouldn't think about letting their first shot at a Star Wars movie fall flat," he said. "I think if anyone was to take over where George Lucas left off, Disney was the obvious choice. "With every trailer they release, I'm getting more and more excited [about] the characters, the costumes, the locales. From what we've seen so far, this certainly feels like a Star Wars movie that I want to see."